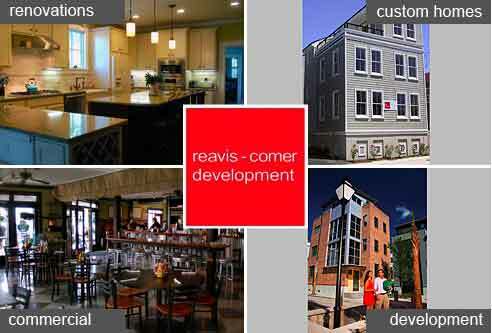 Reavis-Comer Development is Charleston, South Carolina’s comprehensive construction and development company. Broad experience with all manner of materials and methods have enabled us to “do it all”: historic renovations, creative remodeling, general contracting, commercial buildings, restaurant upfits, green construction, custom homes, even entire infill developments. However, it may be our straight-talking, efficient, open-book approach that clients praise us for the most. Contact us to discuss your project and see for yourself. "2012 CITY OF CHARLESTON AWARD FOR DESIGN EXCELLENCE"